This Spring has been a busy time for Urban Releaf, with April 2014 being somewhat of a whirlwind month in particular. Thusfar in 2014, Urban Releaf has planted approximately 150 trees! We have been averaging about one tree-planting event a month, including the MLK Day of Service, Arbor Day, and, most recently, Earth Day. These events have allowed Urban Releaf to do what it does best—plant-trees and create healthy communities—while also affording numerous opportunities for community engagement in and around various Oakland neighborhoods. Being connected to the community and knowing your organization is helping to make a measurable and positive impact is one of the best feelings there is. Urban Releaf was also honored recently by the UC Berkeley Democratic Club, with the 2014 “Environmental Activism Trailblazer Award.” Such honors suggest that after 17 years of on-the ground work planting trees in inner-city neighborhoods, the Oakland-based non-profit is becoming increasingly recognized for its contributions in the field of urban forestry. With Urban Forestry being identified by the California Air Resources Board (CARB) as one of five priority areas for Green House Gas Reduction Fund Investment, aka cap-and-trade, Urban Releaf has also been working hard on developing its policy platform. For the past year, Shakur has been a member of CARB’s Environmental Justice Advisory Committee (EJAC), which makes recommendations to the state on how best to allocate GHGRF funds, which are expected to be disbursed for the first time in FY 2014-15, eight years after the passage of California’s landmark carbon-emission reduction law, AB32; on April 10th, EJAC wrapped up its meetings with a final gathering in the state capitol of Sacramento. As Shakur shares, the experience was both a positive one, and an opportunity to learn more about environmental policy in other fields. “Being a part of the committee was a very enlightening experience,” she said. Urban Releaf is also one of many prominent green organizations in the SB535 Coalition, made up of environmental justice advocates and stakeholders in SB535, a bill which earmarks 25% of GHGRF funds to “disadvantaged communities” who suffer from the worst levels of toxic environmental pollution in California. Shakur and Program Manager Kevin Jefferson recently attended the Greenhouse Gas Reduction Fund Workshop at UCLA’s Luskin Center, where they networked with environmental justice advocates, community members, and urban forestry representatives. 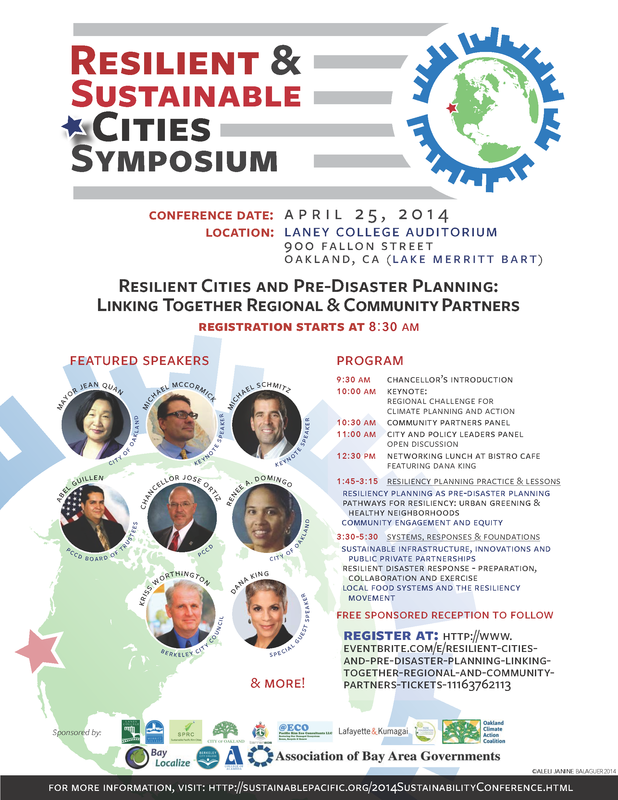 Urban Releaf was also featured prominently in the recent Resilient and Sustainable City Symposium put together by Oakland city planner (and UR board member) David Ralston. Jefferson was a panelist on the discussion around “Pathways for Resiliency: Urban Greening and Healthy Neighborhoods,” while Shakur contributed to the conversation around “Sustainable Infrastructure, Innovations and Public-Private Partnerships” and was the featured speaker at the post-symposium reception. Going into the summer months, it’s clear that Urban Releaf and urban forestry are both generating momentum. Our agenda for the near future includes finalizing our proposed “Million-Tree Initiative” for Oakland, continuing to be part of the state and national conversation around urban forestry and greening urban cities, as well as helping Oakland’s elected officials—and those running for election later in the year—remember that the environment must be a high civic priority for sustainable development, and that urban forestry is one of the simplest, yet most effective, pathways to environmental justice. To donate to Urban Releaf, click here.